Macworld Expo is just a month away, and rumors of a thin 12" MacBook Pro are rampant. In other MacBook Pro news, Hardmac reports that Apple appears to have halted production of both the 15" and 17" models temporarily. A new website provides links to useful software for MacBook users, and the clever Huckleberry mirror lets you turn your MacBook into a video camera. Toshiba has achieved 100 GB on a 1.8" hard drive, the size Apple uses in the iPod, and we report on two programs to control the speed of the MacBook's fan. Will Apple Make a 12" MacBook? MacBook Pro Production Temporarily Halted? "As Macworld creeps up on us (only a month away now! ), rumors of the iPhone and what features the iTV will have aren't enough for the Mac web. Because of this, in comes the smaller, ultrathin MacBook Pro rumor, which claims that there will be a new iteration of MacBook Pro that will use the 12-inch form factor - I can hear throngs of 12" PowerBook users cheering in the distance - as well as be much thinner and much lighter than its current design." "Have we seen the end of Apple's ultra portable laptops? Hopefully, no. "Many users demand ultra portability because of frequent travel. In my case, I frequently travel to third world countries for international relief work. I need something that's ultra portable with a decent battery life. Stocked with a few extra batteries, it might be days before I can plug into an electrical outlet to recharge a battery. "Here are the reasons why we 12" PowerBook users feel abandoned and why we hope Apple will produce another ultra portable laptop...."
Link: Will Apple Make Another 12" Laptop? "Last Monday, we have received a message from Pierre-Yves. "I wanted to purchase a MacBook Pro 17" Core 2 Duo, but I was told that they had received a message from Apple asking for not taking orders of MB Pro anymore; with no additional information. We were following this news, waiting for additional information, comments or reports, and today we have received another message from FxParis. "It remains unclear if the production is stopped for all MacBook Core 2 Duo or only for those models with the non-glossy widescreen LCD display." Link: MacBook Pro Core 2 Duo Production Is Stopped!? For a collection of links to mostly MacBook & Intel-ready applications, visit Extremely Useful MacBook Freeware. "Sony has admitted it could have moved 'more quickly' to tackle the burning battery bug that hit two of the company's biggest power-pack customers, Dell and Apple, and prompted many others to recall Sony-made lithium-ion batteries. "In an interview with Japanese-language newspaper the Mainchi Shimbun, relayed by Agence France-Presse, Sony President Ryoji Chubachi is quoted as saying: 'The company should have investigated the cause of the battery problem more quickly.'" "You see alot [sic] of damaged computers in desktop support, but this morning a real doozy rolled in. This one had been accidentally dropped from a 3 story balcony." "Without going all techie on you, let me just say the shift from the Core Duo to the Core 2 Duo chip delivers a nice speed bump without cutting into battery life or making the systems run hotter. The revised lineup of laptops doesn't mean their predecessors are candidates for eBay, but users who crave all the speed they can get are likely to feel an urge to upgrade. "The best-looking laptop computers have just been tweaked to increase their appeal to holiday shoppers and general users. "However, you'll have a hard time spotting the differences, even with a careful visual inspection. "The exteriors of the latest MacBook Pro and MacBook models from Apple have hardly changed at all. With the exception of a high-speed port on the right side of the 15-inch MacBook Pro, the external design hasn't changed. "The higher-end MacBook Pro retains its silvery aluminum case, while the MacBook still comes in a choice of shiny white or matte black plastic. "Once you press the power button, however, you will likely notice how the addition of Intel's Core 2 Duo processors provide brisk improvements in performance." "Last month, I initiated a three-month trial of the Macintosh as a total replacement for my primary Windows machine. That computer is asked to pull double duty as a work and personal machine. It's also the only computer I run e-mail on. And it's the one machine (other than backup) that contains all my data files. In other words, it's got to work flawlessly. "I've had serious pain switching to the Mac (we'll get to that in a moment), but I've also had great success and no second thoughts about my experiment. "...Enter a brand-new, 2.33-GHz Core 2 Duo MacBook Pro 17 with a 160 GB hard drive and glossy screen. I love this new 17-in. MacBook Pro. The screen is glorious. The performance is top-notch. It became my primary computer about 10 seconds after it first booted. "If I decide to go back to Windows when this Mac trial is over, returning to my ThinkPad T60 Core Duo may be a very difficult move. I've settled into the MacBook Pro 17 and Mac OS X 10.4.8 as if I was born to them. If the Mac OS doesn't mesmerize me to the point that I lose all interest in Windows, this piece of hardware might just do that all on its own. "My only complaint is that the spacebar squeaks whenever I press it. Whoop-de-doo. I'll head to the nearest Genius Bar and see if I can get Apple Computer to replace it free of charge. "Why can't Dell, Hewlett-Packard or even Lenovo build notebook hardware this good?" PR: QuickerTek announces the addition of support for Apple iBooks to the Quicky USB Transceiver. No longer do iBook users have to resort to disassembling the computer to gain wireless networking enhancement. iBook users can double the wireless performance for a suggested retail price of $225 from either authorized dealers or from QuickerTek. Quicky temporarily clips to the top of the open iBook case. 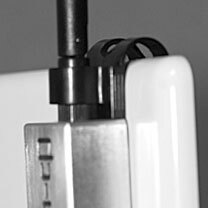 The Quicky is a unique combination of the wireless networking power of the transceiver and an external antenna that is more effectively located up and out of the confines of the iBook case. It requires no computer skills to either set up or use - no extra steps are necessary. Once Quicky is clipped on and the short USB cable is connected to the USB port, users experience ten times more RF power than a stock iBook. This additional wireless power produces greater operating distances from the AirPort Base Station or wireless access point and more available networks to choose from. Quicky works with all 802.11/b/g WiFi equipment including Apple AirPort and AirPort Extreme. Quicky works with all AirPort-equipped iBooks and requires no software drivers. Quicky now works with USB and AirPort-equipped PowerBooks, MacBook Pro, MacBooks, and iBooks. PR: Ecamm Network on Wednesday announced the immediate availability of the Huckleberry MacBook mirror. Ecamm will offer Huckleberry via their ecamm.com website, shipping worldwide. Is your built-in iSight tired of the view? Turn your MacBook or MacBook Pro's camera around with Huckleberry. Huckleberry is a unique mirror device that connects to the lid of any MacBook or MacBook Pro, reflecting the built-in camera's field of view back over the top of the screen. This allows users to create pictures and movies while still viewing and controlling their favorite Mac video application. The Huckleberry mirror is the perfect addition to any MacBook or MacBook Pro. Consisting of an acrylic mirror and two durable plastic mounting brackets, Huckleberry is placed above the screen to reflect the built-in camera's field of view. 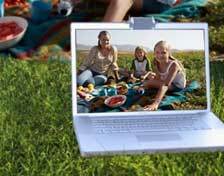 Film home movies in iMovie HD. Ecamm includes their award-winning iGlasses software for image enhancement and video mirroring. with every purchase. iGlasses provides iSight video enhancement and manipulation, including mirror image functionality. Compatible with MacBook or MacBook Pro. Huckleberry is available from Ecamm Network. PR: Toshiba Storage Device Division (SDD), the industry pioneer in small form factor hard disk drives (HDDs), continues to lead innovation in the mobile HDD category with the introduction of the world's highest-capacity 1.8" HDD. The 100GBa two-platter HDD is based on perpendicular magnetic recording (PMR) and propels the functionality and storage capacity of mobile PCs. Designed in the "short" 1.8" form factor, Toshiba's new MK1011GAH offers a footprint that is 10 percent smaller than first-generation 1.8" drives. 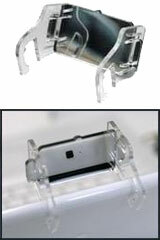 With an areal density of 155.3 Gbit/in2, the drive is specially designed for thin and light mobile computers with an 8 MB cache. In addition, Toshiba's new 1.8" capacity leader features the same tunnel magnetoresistive (TMR) head technology combined with perpendicular recording that delivered the company's world-leading 200 GB capacity in the 2.5" HDD class with an areal density of 178.8 Gbit/in2. "We are enhancing the capabilities of PMR with the incorporation of TMR head technology to deliver another industry-leading mobile HDD," said Scott Maccabe, vice president and general manager, Toshiba Storage Device Division. "Toshiba's technology innovation is setting the bar for mobile HDDs, and our first-to-market position in PMR is clearly helping us define the possibilities for pushing capacity limits in the mobile sector with more than two million mobile PMR HDDs shipped and over a year in commercialization." Toshiba's 100 GB 1.8" HDD integrates a low insertion force (LIF) connector, providing a format that enables mobile PC manufacturers to easily transition to higher capacities in smaller footprint HDDs. Marking its technology leadership in mobile HDDs, Toshiba was again the world market-share leader in HDD shipments into consumer electronics applications and tied for the lead in overall mobile HDD shipments, for the third quarter of 2006 according to leading research firm IDCb. Toshiba commands a resounding 80 percent share in the 1.8" category, according to IDC, and has shipped more than 40 million 1.8" drives since introduction in 2000. 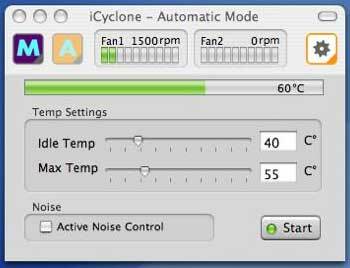 PR: iCyclone lets the user set the minimum speed of the built-in fans. So you can increase your minimum fan speed to make your Mac run cooler with manual mode or let the program set the minimum fun speed for an appropriate Idle temp with Automatic mode. In order not to damage your machine iCyclone let's you not set minimum speed to a rate under Apple's defaults. Growl is a notification system for Mac OS X. It allows applications that support Growl to send you notifications. With Sparkle integration applications is able to get instant self-update functionality. it'll read the update information from iCyclone server, download, extract, install, restart, and even offer to show the release notes before to decide if you want to update. smcFanControl lets the user set the minimum speed of the built-in fans. So you can increase your minimum fan speed to make your MacBook run cooler. However in order not to damage your machine smcFanControl let's you not set minimum speed to a rate under Apple's defaults. To change fan-speeds you need to authenticate with valid credentials of an user-account with admin privileges. If you want to auto-apply your changed settings after a restart, check the "auto apply after launch" checkbox and add smcFanControl to your Login-Items. Adds support for the new 17" MBP with Core 2 Duo CPU and some fixes related to authentication.